The Central Diner (now named Elmwood Diner) in Providence, Rhode Island was built in 1947. It was added to the U.S. National Register of Historic Places in January 2010. This is a list of notable diners. 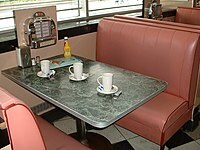 A diner is a prefabricated restaurant building characteristic of American life. They are commonly found in the Midwest, New York City, Pennsylvania, New Jersey, and in other areas of the Northeastern United States, but they are not limited to these areas; examples can be found throughout the United States, Canada and parts of Western Europe. Diners are characterized by offering a wide range of foods, mostly American, a casual atmosphere, a counter, and late operating hours. Diners commonly stay open 24 hours a day, especially in cities, making them an essential part of urban culture, alongside bars and nightclubs. The Frazer Diner was built by the Jerry O'Mahony Diner Company and is now the only remaining example of an unaltered mid-1930s streamline modern O'Mahoney diner. Mickey's Diner in St. Paul, Minnesota was prefabricated in 1937 by the Jerry O'Mahony Diner Company of Elizabeth, New Jersey; shipped to Saint Paul by rail; and installed just before World War II. Miss Albany Diner in Albany, New York was built in 1941. Modern Diner in Pawtucket, Rhode Island was built in 1940. The Rosebud in Somerville, Massachusetts was built in 1941 by the Worcester Lunch Car Company. Pizza chains of the U.S. This page was last edited on 13 December 2018, at 17:25 (UTC).